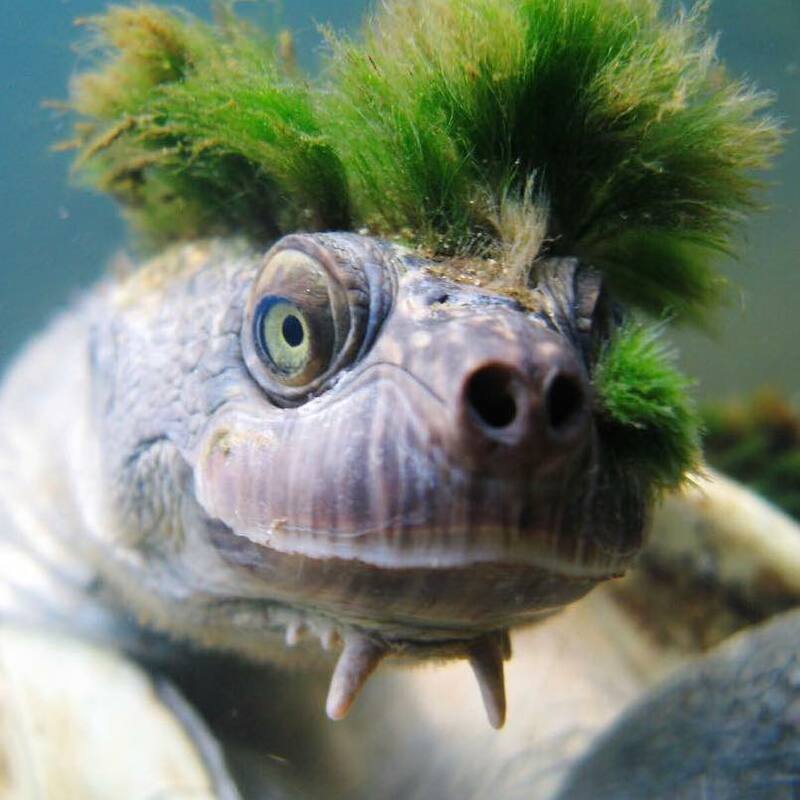 Have you ever seen a turtle with a punk-rock algae mohawk? This quirky creature is a Mary River Turtle, an endangered species named after the river they inhabit – the Mary River in Queensland, Australia. In addition to holding a tiny ecosystem in their punk-rock algae mohawks, these unique turtles have barbed chins which makes them look quite tough! The Mary River turtle supports local algae life, with strands of green algae growing on their heads, shell and body. Back in 2010, Australian Geographic reported that populations of these turtles had dropped by almost 95%. The main threats to this species in the wild is habitat degradation, and include problems such as deterioration of water quality through removal of riverside vegetation, water pollution from chemicals and silt and predation. Local community organisations are trying to protect the remaining population by supporting new scientific research and increasing public awareness. 📷 Photo by Chris Van Wyk. 1. Check out the ZSL List of EDGE species of 2018 where the Mary River Turtle was featured as number 29. You can find more information and see what other animals are on the list that we need to help protect. 2. Follow along with the Mary River Turtle Project (run by Tiaro Landcare) on Facebook to support conservation of them (and if you can raise funds for the punk rock turtle you can help the organization by donating them here). 3. Read the original article on The Guardian which highlighted their status and lack of protection.